Thanks to the Utah League of Writers Conference I have a new take on my book. I was starting over because I was unhappy about my inciting incident, but this conference made me change my mind about that. So now I'm going back to my old manuscript and hammering it out again, but this time with a more positive outlook. 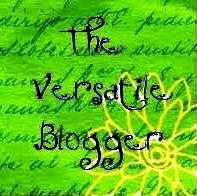 I've gotten two awards this week -- the first is the Versatile Blogger Award from Elizabeth Varadan at Her Fourth Wish Blog. The second is the 7X7 award from awesome blogger friend Kelly over at Writtled. Since I've already done the Versatile award several times and you had endure the ten facts about me last week I'm only going to be highlighting the 7X7 award. With this award we are suppose to talk about a blog post that matches the description given to us. Most Beautiful: First Steps - This is the story of what got me into writing, and every time I read it I am inspired again. Most Helpful: Probably Editing tools becasue a lot of us critique and we don't even know what is at our finger tips. Most Popular: My most popular post is actually a guest post from another blogger, so I'm skipping that and going to the next most popular one written by me, and that one is my story Premonition from the campaign challenge. Thanks guys for making that #1! Most Controversial: I would say Inadequate becasue in that one I totally beat myself up and basically called myself worthless. Which I know is not true, that's just how I felt. Most Prideworthy: Probably my flash fiction about Motherhood. I wrote it on mother's day and it is a perfect testament to how my daughter was at the time. Party. Here. Friday. I'm giving away a few books and a critique so you won't want to miss it! What a neat award to get you looking back over all you've done. Amazing posts! This post must have taken you a lot of time and reflection. You have done so much! You rock. I'm excited to see what this Friday has in store. Congrats on your Awards ... That was a fun one, classifying your posts. It's so interesting how different topics evoke different reactions from the readers. Congrats on the award. Went back on looked at Motherhood, loved it! Oh, and happy to hear to have a new love for your MS ;0). As for my posts, I guess it would Songspiration Thursday-My Dad and Johnny Cash. I love that one. Fun! Congrats on the awards! Now I have to go through and make sure I have read each of these awesome posts. Trying this again since I got some bizarre error! I'm glad you're inspired to pull out an old project and hit it again. Good luck with that, and congrats on your awards! ...it's always refreshing go back and review ancient scribblings, asking oneself, "Did I really write that? Not bad...not bad at all!" Have you had any trouble getting comments to show up?